Back to it again, another redesign. 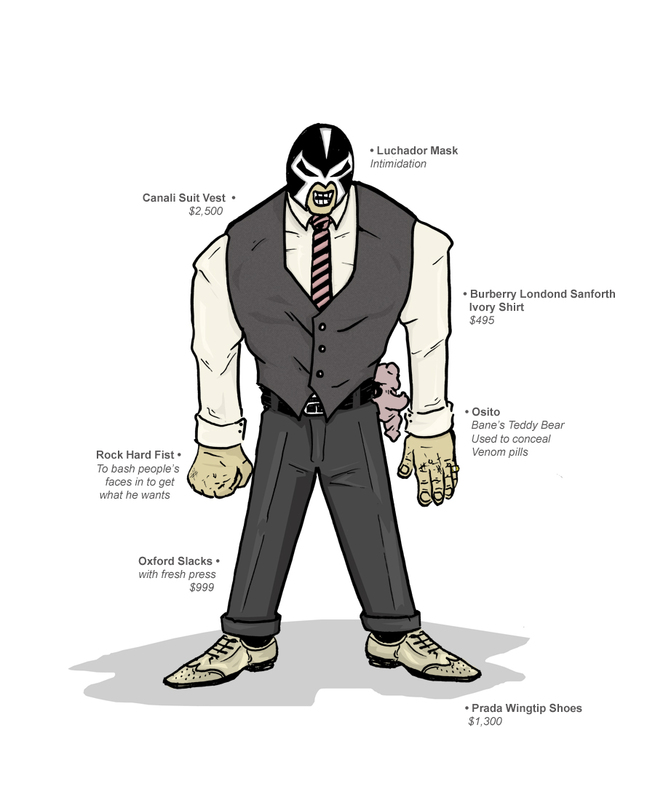 This week Joe Dax decided to request a redesign of the Batman villain “BANE”. Well, I decided to go off the beaten path with this redesign. I thought about what Bane was all about. He is a very intellectual, very strong and very greedy. He has a personality that requires him to be best. Also, there is the venom that jacks him up. Well, it’s 2014, pills are in. Bane just stores his pills in his teddy bear Osito that he has had since prison (true story). I did away with the big bulky easy to rip out tubes that jack him up. So yeah, basically it’s like he’s addicted to cocaine. As for his attire, I don’t know if it is because I recently saw The Wolf of Wallstreet, or because I want to see a big man fighting in dress clothes, but I really think someone with these characteristics would dress the best he can. Kind of like the Kingpin. The vest kind of represents his singlet he used to have. I left the mask, and made it more luchador like since he won’t need the mouthpiece. I modeled the torso from Arnold Schwarzenegger to give him a big chest as well. 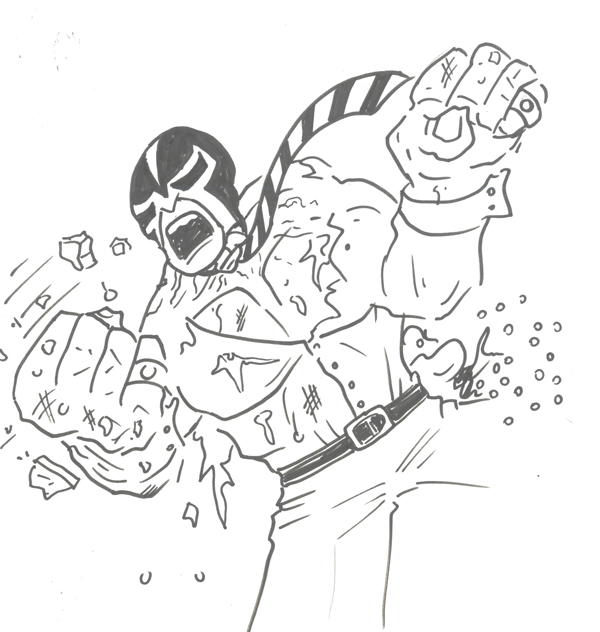 I don’t know if you dig this kind of Bane, but at least check out the sketch that I have of him smashing stuff with his suit ripped to shreds. Ya dig? Hey guys, happy Friday, my favorite weekly holiday! 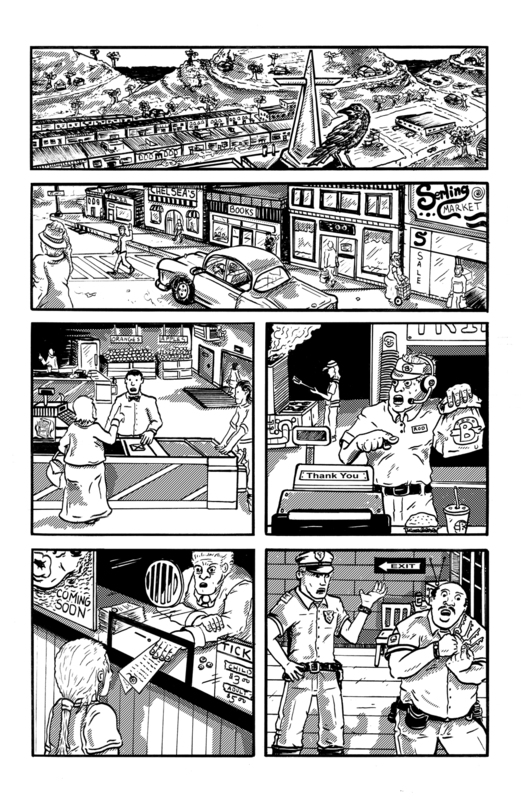 Here is another page from the story I illustrated “Thy will be Done” written by Mick Schubert. The full kickstarter book should be available this weekend! After that, I know it will be available to purchase from those who missed out on the KS campaign. As before, this is just the artwork, and if you want to read it, you will need to buy it. 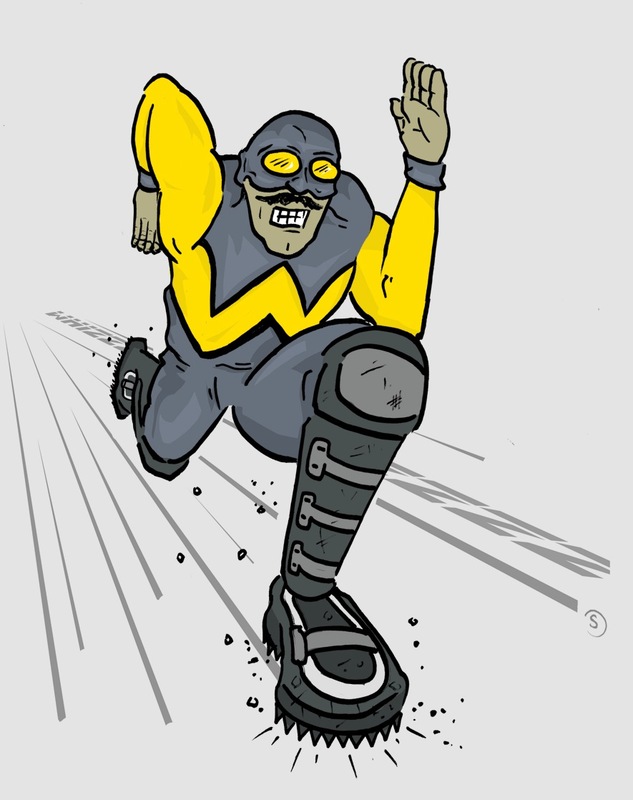 So, Mr. Kansas decided he had to see “The Whizzer” redesigned. I did some research on this obscurity, and found that he is basically just a really really fast runner like The Flash, but creates cyclones and wahtnot. The best part about his origin is that he got these powers after being injeected with Mongoose blood. Yes Mongoose blood. I realized that I can’t give that “real world” spin on The Whizzer, that is impossible. So i decided to spruce his look up a bit. Give him a new color combination, and hell give him a mustache. I worked the design of the new simple suit to have a built in W that hopefully isn’t too annoying and obvious. I gave him some specialty boots that can help with the running around. Also, his skin tone has been darkened compared to his cracker white skin before. But lets be honest, the mustache is what’s winning here. It’s been a great week of productivity. Things are settled in my home, and I can spend more time on Rander Issue 3! Well, I had nothing planned to post this week, so, why not take a screencap of what I am working on. So this is what my screen looks like right now. I am still on track to finish Issue 3 in time to sell at Free Comic Book Day on May 3rd. Not sure if I had shared or not, but the first chapter of Return to Rander has been changed from 3 issues to 4 issues. So it won’t be wrapping up just yet. See you next week! 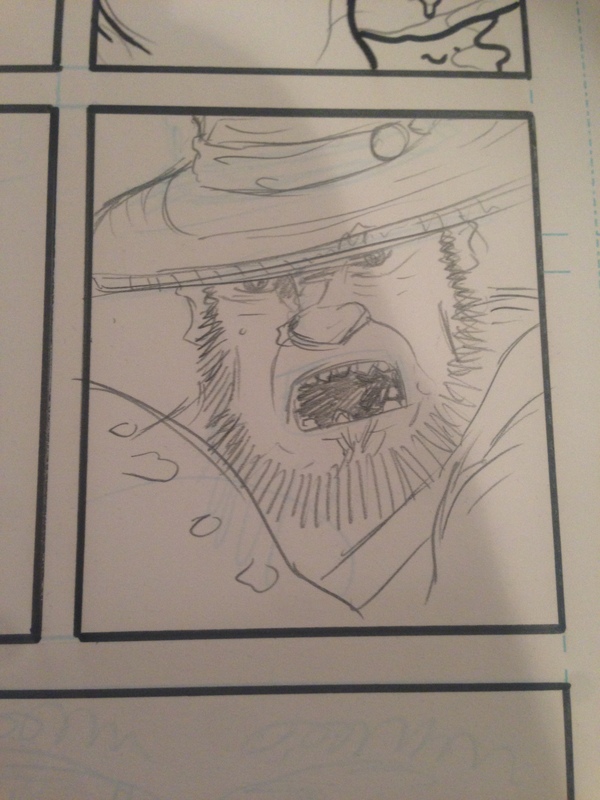 So the boys at Stockpile Comics have invited me to participate in an epic redesign of comic characters. And for that, I thank them! The gist is we each design a character picked for us personally be each of the 6 of us. 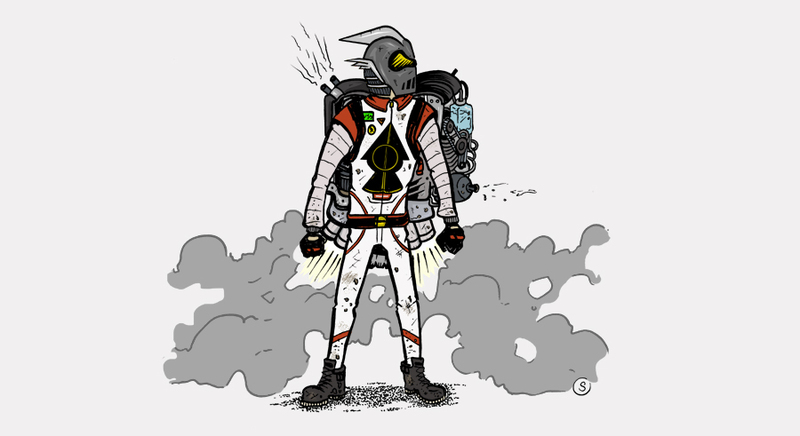 So this week in the Character redesign project, Mr. K. Rian Miller challenged me to redesign “The Rocketeer”. Damn you Miller! How do you redesign a perfect and classic look? There isn’t a thing I would change about Cliff Secord’s costume. Dave Steven’s (RIP) knew to keep it simple to call back to the pulp era. When attacking this, I decided to change the era that we are calling back to. I looked to the decade of muscle cars, and great car chases. Our new Rocketeer is Curt Jacobson, who designed his own jetpack built with a v10 engine and spills oil and grease all over the place. It’s a messy and bumpy ride, but damn does it kick! 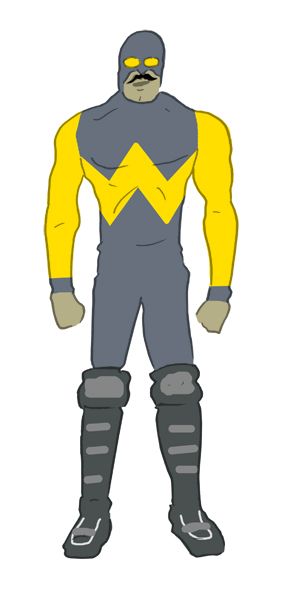 He wears a fireproof racing suit that will keep him safe and warm in the sky. I toyed with leaving the helmet gold, but it just didn’t look right with the rest of the costume, so i decided to alter the helmet slightly but decided to stick with silver to make it his own. I brought the gold into the eye glass which makes sense as it ist easier to see in the sun. Also, it is one large opening as apposed to two eye pieces. I left a simple looking rocket design on his jacket to homage the old rocket. I’m pretty happy with how it turned out, I like the idea of a gritty over the top bruiser as the rocketeer. I see lots of fun muscle cars escaping down the highway as our new rocketeer comes flying above them, with a trail of smoke behind him and smashes onto the roof and cars flip over and explode. You know you wanna see that! See you next week! After a break, Sunday in Rander is back! 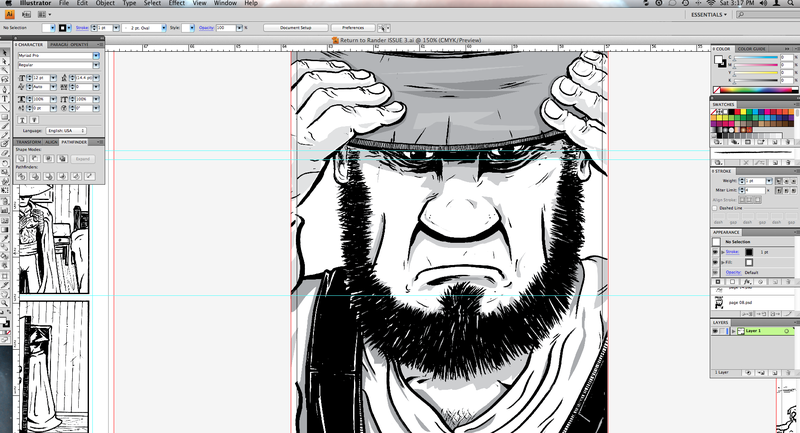 Good news, I have 10 pages of artwork finished of Issue #3! I am gettting close to the halfway mark! The deadline is to have all the artwork done by April 1st, and the book completed by May 3rd for Free Comic Day. 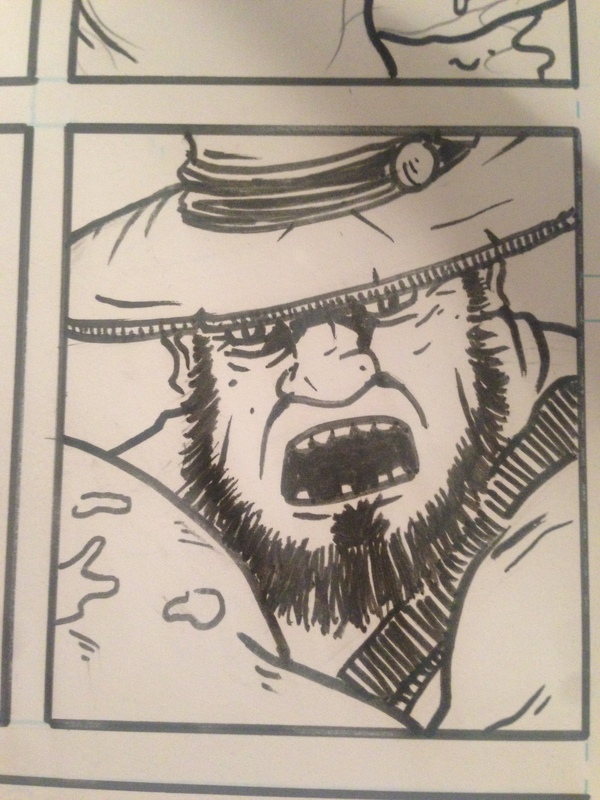 What I am sharing this week is a panel from the third issue. It’s a before and after of a panel of Blane! No context given, so make of it what you will! See you next week. Happy New Year! I have been MIA for a month now, and there are reasons. 1. I bought a new house! And with that, came lots of moving and lots of packing and unpacking. I finally have my new studio set up, and back to work. 2. Is I had a vacation where I couldn’t really work on much art. 3. I have been secretly working on Return to Rander Issue #3 and have a really tight deadline of May 5th to debut it! 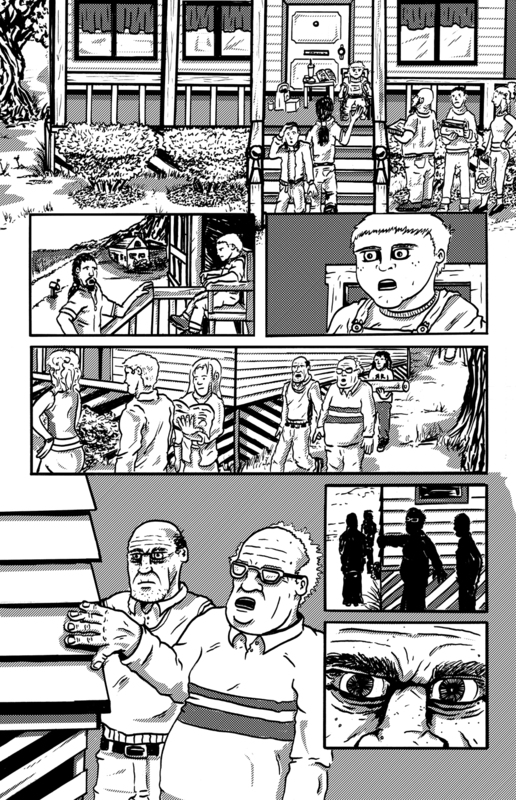 Well here is a page from the comic anthology entitled “Memoirs of the Mysterious” This is the from the short story “Thy Will Be Done” Written by Mick Schubert. I decided to keep the text off so that you have to go buy the comic to know what’s going on. I will continue to post the rest of the pages over the next month or two. Also, look to see Sundays in Rander start back up this week, and also a few other projects I am working on! Here’s to 2014 being a creative year!